Your eyes are constantly transmitting information to your brain, hearing helps the brain to measure motion and through touch, your nerves communicate with the brain about your position in space. Your brain then sends back signals to the muscles to make adjustments via either contraction or relaxation. Unbelievably you use 300 muscles to balance whilst standing still! It’s easy to see how this sensory system improves with exercise such as Pilates. Static balance: The ability to balance while holding one position. Dynamic balance: The ability to balance while moving or changing between different positions. Both static and dynamic balance requires that your centre of gravity is aligned over your base of support. Your centre of gravity is about one inch below your belly button in the exact centre of your body. What happens to our balance as we age? Remember when you were a child and could skip and jump across rocks in a stream without giving it a thought. As an adult, we think more about this action and the risk of falling. Falls risk is a concern as we age. The physical factors that influence falls include: weakening of the lower limb muscles, a decrease in gait ability/sensory-motor control and a reduction in both static and dynamic balance ability. An increased risk in falls also increases the risk of osteoporotic fractures. Unfortunately, these fractures can noticeably reduce the quality of life. The older adult population who are less active or physically inactive are more likely to have balance deficiencies, lower limb muscle weakness and slowed reaction times. Thus, we come to the importance of regular exercise participation. Contrary to traditional resistance exercises based on training muscles in an isolated manner, Pilates exercises require a more holistic approach and require activation and coordination of several muscle groups at the same time. The best thing about Pilates is that it is suitable for all ages and levels of fitness due to the modifiable nature of the movements. At Q Pilates we have a number of clients in their 80’s who do weekly clinical Pilates classes or mat classes. A study titled “Integrating Pilates exercise into an exercise program for 65+-year-old women to reduce falls” (Gonul Babayigit Irez) found that dynamic balance, flexibility, reaction time and muscle strength improved in the exercise group compared to the non-exercise group. The exercise group consisted of 1-hour Pilates sessions 3 times a week over a 12-week period. What standing balance exercises can I do in the studio or at home? To improve Static Balance: When first practising, stand near a bench or something to grab on to for support. This is important for safety. 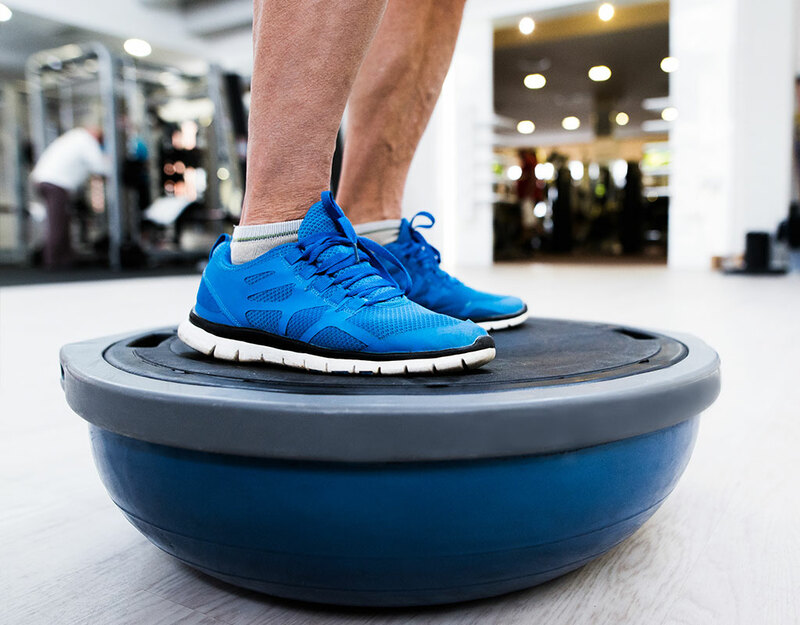 The smaller your base of support, the more difficult it is to balance so begin with feet shoulder-width apart and then gradually decrease the space between your feet. Progress to standing with one foot in front of the other and then try standing on a single leg. Count how long you can hold and try to increase the time as able. To make it more challenging you can add an unstable surface such as a soft mat, pillow, foam pads or wobble board. Once you have mastered this, close your eyes as this will take away the visual system. To improve Dynamic Balance: Whilst static training is important, our bodies are rarely in a single position for a long time. However, by developing static balance it also improves dynamic balance. Try adding movement to the above static poses by swinging arms or a leg. Then try to move smoothly from one position of balance into another. How do the exercises at my class improve my balance? Pilates exercises are designed to strengthen your core muscles such as the Transversus abdominus. If you build up your core strength through a tailored Pilates program, you will develop strong core muscles and thus improve trunk proprioception. At QPilates we use a number of different equipment such as reformers, trap tables, Wunda chairs, wobble discs and balls in your program. The importance of this is that you need to work hard to stabilize your body while exercising on this moving equipment. We can also decrease the spring resistance as required thus giving you more instability and more of a challenge. The different positions that you put your body in during your Pilates program such as 4-point kneeling, planking, kneeling on reformer etc can challenge your balance to varying degrees. Once you have mastered one exercise, we like to decrease the stability in some form to make it more challenging to your core muscles. Remember that a stronger core will mean better balance. The good news is that being consistent with your Pilates program your balance can improve quite quickly.